The gap between rebels and ERG types might be too big to bridge. Amendment: Keep our place in the Single Market? Amendment: Should a Sovereign UK Parliament get a meaningful vote on the deal? Or did people vote for ANY deal. Here we are at the #LibertyAGM getting ready for a day of camaraderie and civil liberties! The essence of a great #LibertyAGM: tea and voting. Sometimes voting can seem far too meaningless. For Remainer Now people, it might seem monumental. But democracy means review, oversight, and the option and processes to change our minds and course as a country if we need and want to. Remainer Now peeps, want to come to the Lords? We've booked a room in the House of Lords, and have a bunch of peers of the realm eager to hear from you. If you can come to London on Tuesday 24th April, and can get to Westminster between 12 and 2.30pm, we'd love to have you. Get in touch. To clarify, this event at the Lords is only for #Remainernow people. A number of #bregretter ladies and gents are already attending but the Lords are keen to hear as many stories as possible so please do reach out if you can attend. Today will be trumpeted as a decisive next step, as we take another firm step to the EU door. We arrived here by trumpeting red, white & blue, by setting impossible red lines. We only reached here by quietly caving in on almost all of them. We arrived here by creating a snowstorm of distraction & by preventing an open, detailed & rational debate about what the future would look like, on the multiple levels of our collective lives. Prepare for more high-handed outrage about the EU today as Britain is back on the back foot. We could have drafted a first Withdrawal Agreement. Because how do you get Agreement when the Foreign Sec wants a hard Irish border to accompany his ambition? And how do you get Agreement when you don’t actually show up to negotiate? Britain’s full of #FireAndFury but there’s not enough substance behind the endless speeches. The devil has always been in the inconvenient Brexit detail. Shiny rose-tinted pronouncements on the fantastic days ahead don’t cut even the English mustard. House of Lords Constitution Committee has harsh words about the parlous state of #EUwithdrawalbill as it reaches the Lords. Lady Taylor, Chair’s comments speak for themselves. 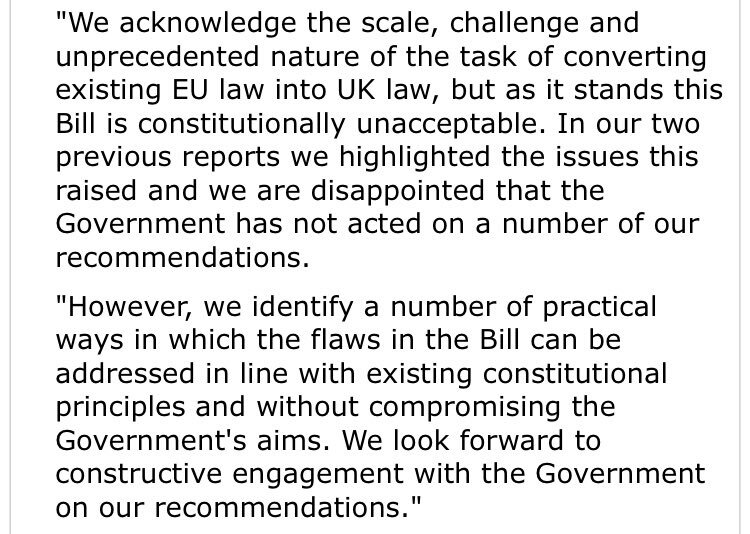 A key feature of the Lords #EUWithdrawalBill report is the number of places in which it states that the Bill, as drafted, is "constitutionally unacceptable" or "not constitutionally necessary or appropriate". That may be the most important aspect for non-lawyers to understand. 1. Worst national leadership in my lifetime forcing through the most damaging, misguided & missold policy I can remember. Ideology & vested self interest replace statesmanship, soundbites replace sound judgement & autocracy subverts democracy. 2. A flawed Leave campaign based on lies, deceit, disingenuity & over simplification & a #Remain one fought w/o any positivity from the Govt & no real commitment from Labour, whose leader was virtually AWOL, did no justice to #Brexit complexity & betrayed our democratic process. 3. A mere 37% of voters/26.5% of the Ppl voted leave in a legally Non-Binding test of public opinion which has been corrupted, on the basis of an illegitimate political promise & interpreted as being the irrefutable Will of the Ppl. The 1st is insufficient to claim the latter!